Good news, Radical Compliance fans! At long last, we will launch a weekly email newsletter this week, so you can have all our posts in one handy location — rather than bookmark this website and check it constantly, which I’m sure you all do now. The newsletter will be sent midday on Fridays, to help you look busy while you try to coast into the weekend. Plus, most compliance and audit professionals’ brains are fried by the end of the week. What better way to decompress than to contemplate the big issues in this field, catch up on your colleagues with our weekly Compliance Jobs Report, and get a chuckle from our Compliance Meme of the Week? We may also mention upcoming conferences, podcasts, or any other events that corporate compliance professionals may want to know about; whatever catches our eye, really. The newsletter has been on the drawing board since Radical Compliance launched in 2016. We’ve just been so caught up in reporting and analyzing news for compliance professionals that we never got around to the newsletter until this week. Q: How did you get my email address? I don’t remember giving that to you. A: I promise that if you receive our newsletter, that’s because somebody entered your email address into our database some time in the past. Observe that column on the right-hand side of the website, where we have a Keep in Touch field to enter your email address. That’s where our subscriber list comes from. We do take privacy compliance seriously around here. Our newsletter recipients are only people who previously volunteered their names and email addresses. Rest assured, I am way too cheap to buy email addresses from marketing firms, and too inept to import all my LinkedIn contacts. Q: Do I have to pay to receive this newsletter? Q: Wait— it’s been two years and you don’t have a newsletter? For real? A: Shameful, I know. 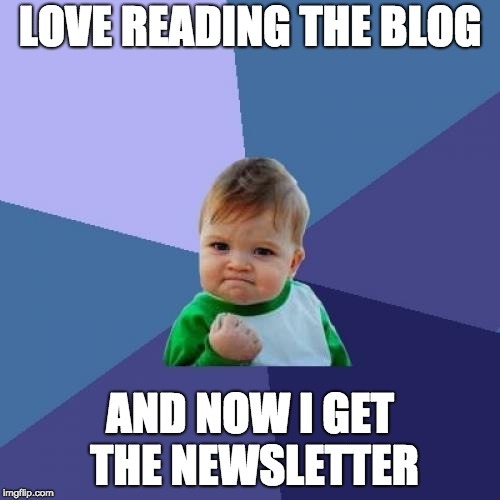 I’m grateful for all the reader enthusiasm since we launched this blog in 2016. Q: I think your blog is awesome. Can I forward the newsletter to other people? A: Thank you for the compliment. Yes, feel free to forward it to anyone you like, and encourage them to sign up for direct distribution, too. Q: Changed my mind! I don’t want this anymore. How do I unsubscribe? A: We will have unsubscribe procedures identified at the bottom of every newsletter you receive. If all else fails, email me directly at [email protected]. Q: I have some news I’d like you to include. How do we do that? A: You email me directly at [email protected]. I will take news tips, research ideas, new jobs or other career news you want included in the Compliance Jobs Report, or even a meme you want me to include in the Compliance Memes Gallery. A: No, thank you. I love this stuff and couldn’t do it without your support.